In case the above panel didn’t make it obvious, “Flip” was an African American teen with a fondness — nay, obsession — for deep sea diving. While Flip’s inclusion in the second-generation Newsboy Legion can be seen as a manifestation of the the self-consciously inclusionary spirit of the era, I’ve long wondered about the thought process which led Kirby to such an eclectic combination of hobby and ethnicity. That’s not meant to be either a dig at the King’s creative powers or a quasi-racist generalization. What I mean is that Kirby wore his immediate influences pretty prominently on his sleeve. Hence my bafflement about “Flippa Dippa.” Though the character could been seen as an oblique rebuttal to an old racist canard, I wondered if there was more to it than a random bit of zaniness guided by the multicultural zeitgeist. The specific popcultural context — if there was one — eluded me, however. The previous decade’s Ivan Tors/Irwin Allen/Lloyd Bridges-fueled obsession with aquatic adventure had long subsided by the time Flip dogpaddled onto the scene, and Jaws phenomenon was a still a few years down the road. 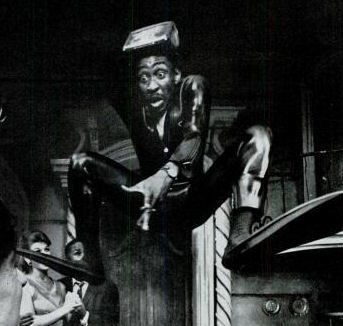 The photo is from a brief write up of Bruce Jay Freidman’s play, Scuba Duba, a very 1960s (in both the negative and positive senses of the term) comedic examination of race relations which starred the late, great Cleavon Little as the wet-suited titular character. I have neither the resources nor (more importantly) the motivation to conduct an academic investigation, but the similarities in both (rhyming) name and appearance strike me as more than coincidentally close — especially given the coverage given to the play’s controversial nature, which was big enough to earn a write-up in LIFE and, perhaps, to register in Kirby’s inspirational memory for (subconscious?) future reference. Brother, can you spare a space dime? You, sir, are a gaddam national treasure. I’m friends with Friedman’s son on Facebook; I forwarded this to him, and he says he’s going to share it with his dad. Friedman was a writer and editor in the Martin Goodman magazine empire during the ’50s. Who knows? Maybe he’s been aware of this all along. Good work! I agree that based on the evidence shown, Kirby was probably referencing Scuba Duba. 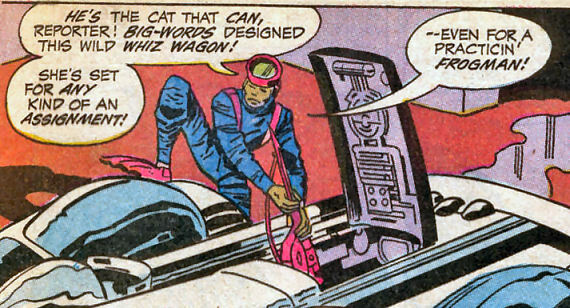 Also, saying “the Whiz Wagon” makes my inner twelve-year-old giggle every time.